Environet is the UK’s leading specialist in Japanese knotweed removal from residential and commercial property. Established in 1996, we have a proven track record in safely and efficiently dealing with Japanese knotweed and other invasive species. Trust us, we will get the job done. We have a friendly, dedicated and highly skilled team of knotweed specialists helping solve knotweed problems across the UK. Our guarantees are underwritten by a syndicate at Lloyds, an A-rated insurer, giving you the ultimate peace of mind. More than 90% of our customers rate their experience with Environet as "Good" or "Excellent". We respond quickly to all of your needs. Our insurance backed guarantees can be issued within hours of your instruction. We take the environment seriously here at Environet. We've developed zero-waste to landfill solutions like Xtract™ and Resi-Dig-Out™. Our policies, procedures and staff have all received the Property Care Associations stamp of approval. Our vision is simply to be “the best” in the Japanese knotweed removal market. That means pin-pointing our customers’ needs and fine-tuning our offerings to build on our reputation as “no.1 dependable knotweed professionals who don’t let their customers down”. Our continued growth and success is thanks to the passion of our highly motivated, knowledgeable and efficient team in delivering solutions with real-value to solve our customers’ knotweed problems. We look for hardworking reliable staff with natural ability, a “can-do attitude” and who take great pride in their work. Not surprisingly our customers find each member of our team to be helpful, trustworthy, polite, and positive with a natural determination to do what we promise. We gain huge satisfaction earning our customers’ trust and respect by demonstrating our expertise, reliability, honesty, efficiency and value. We’re busy professional people at the forefront of perfecting eco-innovative solutions to the knotweed problem. Like all humans we don’t always get it 100% right first time, but you have our promise we’ll do everything we possibly can to deliver the desired result. Other than pay us on time, all we ask is you recommend us to others if you feel we’ve excelled. That is how our business has grown, and how we want it to continue to grow in the future. Our customers value the strength of our guarantee and the reassurance the insurance backing of an “A” rated syndicate at Lloyd’s provides. We have an ethos of continuous improvement to eliminate or reduce the risks with detailed working procedures, on-going training and monitoring. All of our staff have health and safety and emergency first aid training. We are also accredited by CHAS and Constructionline. Environet was established in 1996 by our Managing Director, Nic Seal. For many years we provided a wide range of environmental consultancy services, including contaminated land assessments, to the property sector. In 2008 Environet designed and developed the Xtract™ machine enabling us to remove Japanese knotweed rhizome from infested soil both effectively and economically. 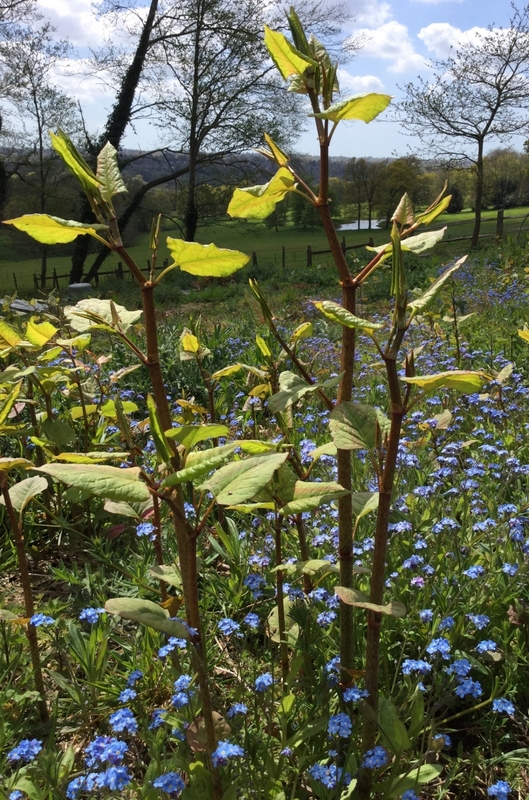 The amount of work related to Japanese knotweed rapidly increased due to tighter lending requirements imposed by the banks and building societies. We decided to make our sole focus the removal of Japanese knotweed, creating a team of national regional managers to assist property professionals and owners of commercial and residential land. To reflect this we changed the company name from Environet Consulting Ltd to Environet UK Ltd. In 2013 Environet obtained the backing of an insurer at Lloyd's who now underwrites all of our insurance backed guarantees when removing Japanese knotweed. 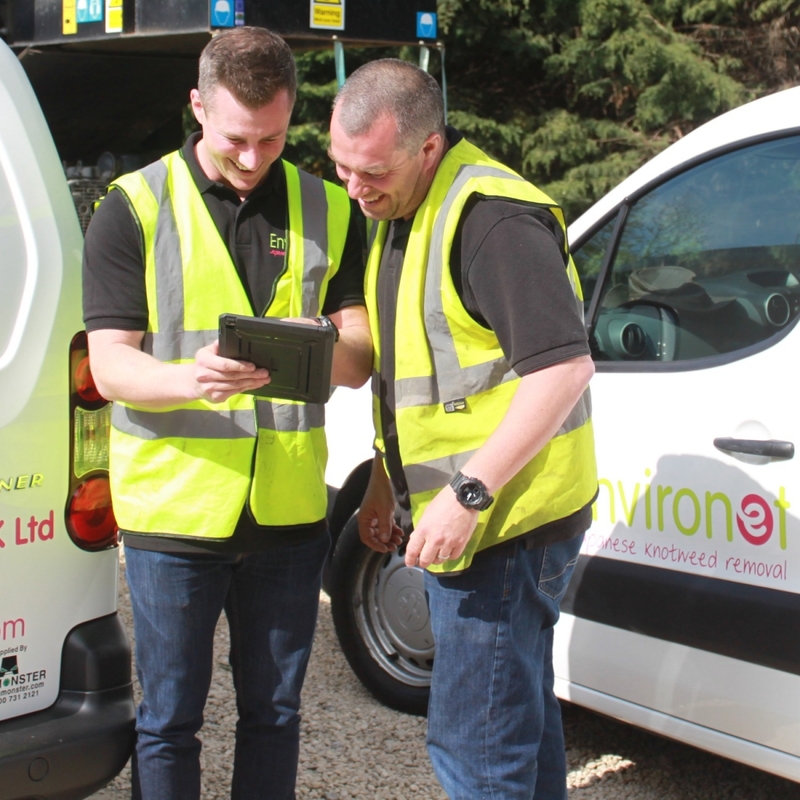 Our success is based on our 'Core Values' combining professional expertise, market leading technology and motivated teams to give our clients the reassurance of the rapid removal of Japanese knotweed. The business moved to its new Head Office between Guildford and Woking, a 5,000 sq ft warehouse building to accommodate all head office staff, all equipment and our research & development activities. Mk3 of our patented Xtract™ machine was launched, with enhancements to improve the process rate and manoeuvrability with addition of caterpillar tracks. Xtract™ Mk3 was featured by ITN Productions. With the new machine, it was the year that we carried out our largest project, processing in excess of 3,500 cu m of infested soil. Environet launched and sponsored the 'Schools Eco-Innovation Awards Scheme' at the Moat School in London, endorsed by Kevin McCloud, MBE. We bought a parcel of land in Sussex infested with Japanese knotweed to use for our R&D field trials. Our 21st birthday - incorporated in 1996, nearly up to project number 10,000 and counting. We bought the freehold to our 6,500 sq ft Head Office/Warehouse between Woking and Guildford. We provide several services, free of charge, for example our Japanese knotweed identification service. We invite potential clients to make a small donation to one of our chosen charities: Cancer Research UK, British Heart Foundation and RNLI. We've recently added our support to The Archie Lloyd Charitable Foundation, an inspirational new charity set up by the Lloyd family in memory of their son Archie, who was tragically taken from them. The charity seeks to inspire and motivate young people. Further information can be found on our JustGiving Page. Environet offer a 10% discount on the cost of all work to remove Japanese knotweed. We hope this will assist registered charities to achieve their respective goals. For further information in relation to this policy, please contact the Environet team at expert@environetuk.com. If you're happy with the service so far, and know others with a property affected by knotweed, why not tell them about the Environet team and our Neighbour Discount scheme? If you know there is affected property in your street or an adjoining one, and they tell us you recommended Environet, we'll offer them our Neighbour Discount of 5%. Upon receipt of their instructions and deposit payment, we'll also send to you the value of their discount, up to a maximum of £250 as a little thank you. The discount scheme applies to knotweed treatment or removal programmes only, it does not apply to consultancy, surveys, or any expert witness work. The 5% discount offered to the referred will be deducted from the agreed contract sum payable to Environet UK Ltd. The 5% (up to a maximum of £250) offered to the referrer will be paid by cheque within 30 days of receipt of the referred's instructions and deposit payment. We reserve the right to end this promotion at any time without prior notice. Environet launched its annual Eco-Innovation Awards Scheme in the autumn of 2015. We are delighted to sponsor this scheme which is aimed at children with dyslexia and other learning difficulties. We like to encourage children to think about the ways the environment can be improved and protected using their creative design and practical skills by focussing on the benefits of sustainable product design versus the throwaway culture. The award is supported by Kevin McCloud, MBE. If you would like further information or would like to nominate your specialist school for the Eco-Innovation Awards Scheme then please get in touch with the Environet team at expert@environetuk.com.